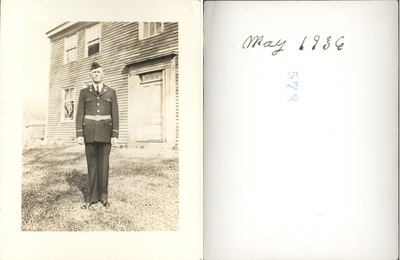 "Henry L. Foss Photograph in Millitary Uniform, Madison, Maine, May 193"
Photograph of Henry L. Foss dated May 1936 on the back. Family indicates this was taken infront of the old homestead on E. Madison Rd, Madison, Maine. "It must've been a picture for the legion or something, because it's dated 1936."